I don't disagree. One comment though - if you take few outliers like Ramanujan, Bose, Tagore out; India should be around 40. Either that or that 76 is fake just like most of their resumes. Some Nepalse also makes fake resume. IQ is measure of literacy more than of intelligence. Thats why country with high literacy have higher IQ. 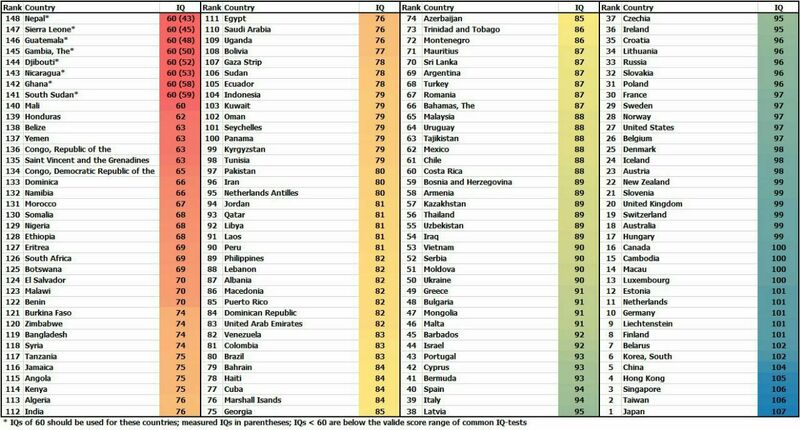 Another thing, these reported IQ for a country is based on tested individuals, so its really not a measure of intelligence, rather measure of educational opportunities and how it affected their cognitive abilities among the tested individuals. Also, IQ score is highly correlated with socio-economic status, thats why children from private school and colleges score higher on average. I concur you can measure variation in intelligence between a dog and a human, but never can measure variation in intelligence between two population of humans, either by country or ethnicity. I have seen overly dumb degree earned individuals and seen smart people who learned from wikipedia and their life lessons. So, keep all this IQ nonsense aside and do your work properly, thats where intelligence is really at work. Fianlly, everyone is intelligent for what they know, dumb for what they dont, and stupid for faking that they know something when they dont. They do, a lot of them actually.